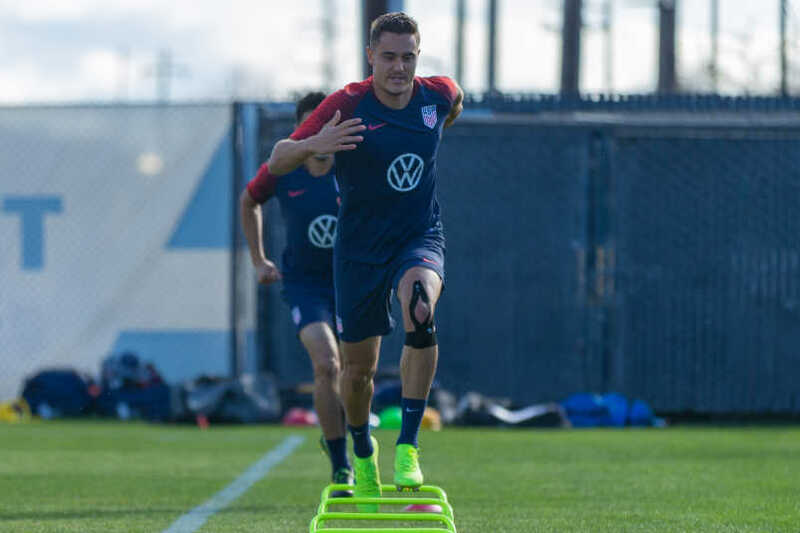 By Clemente Lisi – HARRISON, NJ (Mar 18, 2019) US Soccer Players – Aaron Long is the latest talent to come out of the Red Bulls' system. Over the past few years, the Red Bulls have relied on many young talents like Tim Ream, Matt Miazga, Tyler Adams, Sean Davis, Conor Lade, and Tim Parker. Some have moved on. Others, like Long, are working hard to help RBNY win its first MLS Cup. Named MLS Defender of the Year last season, Long was originally drafted into the league 36th overall by the Portland Timbers in 2014. Released by the Timbers, Seattle acquired Long before he joined the Red Bulls in 2016. Long refined his skills with Red Bulls II in 2017, winning the USL Defender of the Year and helping the team win the USL regular season and USL Cup. It was last season that Long got a chance to start and he had a breakout second season in a Red Bulls jersey. His center back partnership with Parker was a big part of why the Red Bulls captured the Supporters’ Shield. The 26-year-old California native played in career-high 31 games and made the MLS All-Star team. Long’s strong season first caught the attention of then-interim US coach Dave Sarachan, and more recently coach Gregg Berhalter. Long grabbed his first senior cap in October against Peru and was captain for Berhalter’s first two games as coach in the US’s January friendlies versus Panama and Costa Rica. He is in the squad for the USMNT’s two upcoming friendlies against Ecuador and Chile. We spoke with Long about his team’s strong start to the MLS season, his meteoric rise, and how he hopes to be a part of the National Team on a regular basis going forward. A big part of your success and that of the Red Bulls last season in winning the Supporters’ Shield is the defensive partnership with Tim Parker. How did you both become so compatible as a center back pair? If I had to choose any center back in the league to play next to, it would be him. How lucky am I that I have Tim on my right and Luis (Robles) behind me in goal? After last season’s success, you got a call to be a part of the National Team’s January camp. How did you react when Berhalter informed you that you’d be wearing the captain’s armband for those January friendlies? That was a surprise for me for sure. Just looking back, what a great honor. It’s something you can never prepare for, in my position, in that moment. Looking back on it, I will forever be so proud of that. The Red Bulls were able to win their home opener 4-1 against the San Jose Earthquakes, a game where you were trailing 1-0 after the opening 45 minutes. What happened in the dressing room at halftime? We were at home, we’re losing and we needed to step up our pressure a little bit. We changed our tactics in the way we were going to press and it really helped out. San Jose’s Chris Wondolowski came into Saturday’s game needing a goal to tie Landon Donovan for the all-time scoring record in MLS. Was that on your mind going into this game and in the first half when he looked especially lively up top? I think it was said earlier in the week that we said let’s make sure Wondo doesn’t get this in our building. During the game, to be honest, I didn’t think about it. After exiting the Champions League to Santos Laguna, it was vital to grab a win, especially at home. How important was it to win the home opener and get the MLS season off to a strong start? It was so nice to be back in our building and see it pretty full. The fans were loud and to get the win. It was icing on the cake. You now get some time away from MLS and travel with the US National Team for its upcoming friendlies against Ecuador and Chile. Just two years ago you were playing in the USL and you went from that to captaining the team in January. Does it feel surreal sometimes? I wouldn’t say surreal, but it’s still so exciting every time I get that email saying that I am going. It’s a great opportunity and I have to prove myself again. Your next goal, when it comes to the National Team, is making this summer’s Gold Cup roster. How difficult will the next few months be for you in order to keep playing at such a high level? For sure. That’s the next goal. Every game, every training you’re getting evaluated. There are many talented center backs in the US, so I know that every time I go play, I will have to show my stuff if I want to come back.